Mayor Wayne Powell presents MBPD Lt. Andy Harrod with a plaque and city pin for 40 years of service as MBPD Police Chief Eve R. Irvine looks on. Known for his affable demeanor and "can do" attitude, Manhattan Beach Police Lt. Andy Harrod was recently feted for 40 years of service at the March 4th City Council meeting. As former police department colleagues, current PD, city and MB Fire Department staff looked on, Mayor Wayne Powell awarded Harrod a plaque and city pin. During the ceremony, Police Chief Eve R. Irvine noted that Harrod was selected as the 2014 Police Officer of the Year by his peers. In 2004, he received a South Bay Medal of Valor Award for Sustained Superiority. Irvine told the standing-room-only crowd that Harrod is "always positive" and "emphasizes teamwork," calling him out for taking on any project or assignment sent his way and always looking at the positive side of things. "Any time we're having a bad day," Irvine said, "he (Harrod) says, '"You know what, you can't beat it. We're at the beach. The people are nice. Everything's great. Life is good.' He has such a great attitude." Harrod, who has worked patrol, crime prevention (now community affairs), crisis negotiations, D.A.R.E. (Drug Abuse Resistance Education) and been an interim chief, now manages the motorcycle officers and parking and animal control. Irvine had fun telling the audience of Harrod's love for motorcycle riding. "You'll see Andy out there as a riding lieutenant. He loves that bike." Harrod recently led the March 6 MB Little League/MB Girls Softball parade on his bike. Irvine cited Harrod's ability to work on a diversity of projects, saying he is the "'go to' guy. If you don't know what to do with a project or assignment, you think of Andy. He gladly accepts" any assignment. Harrod presently serves as the department's fleet manager and ensures the police department's building is in working order. 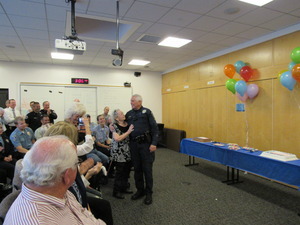 MBPD Lt. Andy Harrod celebrates 40 years of service with his mom at a celebration held to commemorate the occasion. "Here's the thing about Andy," said Irvine. "He does so much for the organization and the city but he never accepts the credit. It's always a team effort. He says everything is a team effort. He never does anything on his own. "And yes, that's true but you really should be commended for the things that you do to ensure that those things get done for the teams," Irvine said. "This career went so fast. I'm not retiring (in answer to a comment from the crowd). Forty years is just remarkable... It's a team effort. It really id. It's been a great opportunity to take on the projects that we've done over the years, complete them and make the city a better community for everyone and safer for everyone. "It's a pleasure to work with everybody over the years. It's been awesome. Thank you."